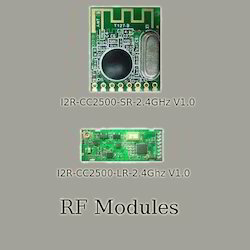 With our expertise in the respective domain, we are engaged in offering our clients a wide range of RF Modules. Products like receiver, transmitter and transceiver modules has complete wireless RF modules that meet the application requirements of ISM band wireless. Available in both long as well as short range, these modules re based proven TI Chip sets known for their high performance. With the support of our professionals, we are able to provide entire pre/post consultancy and training services on hardware, software, custom design and support. This saves the time of the customer of integrating RF modules into the required, thus saving time and money. Our organization holds expertise in manufacturing and exporting an extensive range of RF Modules Short Range. These modules are manufactured at par with the set industry norms to meet the requirements of band wireless applications. We offer these products in both long and short range with proven TI Chip sets. 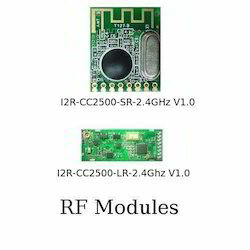 Various products like RF receiver, transmitter and transceiver modules it provided by complete wireless RF modules for ISM. We provide pre/post consultancy and training services to our clients on hardware & software in order to save their time and money. Our expertise and in-depth industry knowledge helps us provide optimum quality range of RF Module Long Range. Highly appreciated for their durability and longer service life, these modules have RF receiver, transmitter and transceiver modules, for ISM band wireless applications. In order to meet the application needs of our clients, these products are offered in both standard as well as customized forms. For the convenience of the user, we provide pre/post consultancy and training services on hardware, software, custom design for RF integration. Looking for RF Modules ?